Collect all the orders and reach 15,000 points to complete the level. This level has medium difficulty. 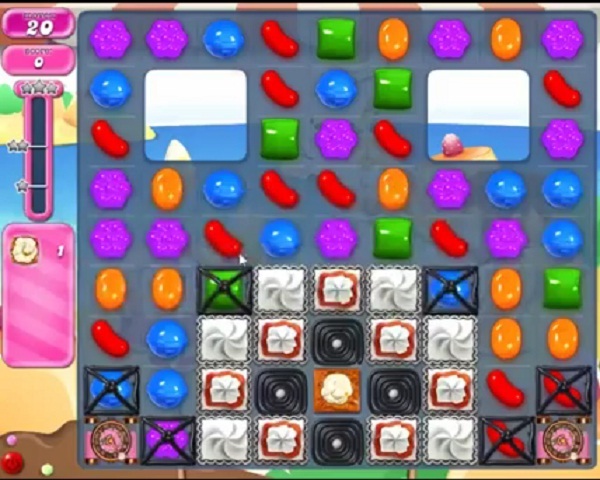 For this level try to play more from bottom part of the board where more candies are available to play. Make special candy and combine them with other special candy to break more blockers. Or play near to blockers to break them without wasting the moves. Break popcorn blockers as you get the chance to complete the orders. SERIOUSLY, I’m sooo NOT in the mood for this!!! 16 moves??? Play from the bottom??? There’s NO TIME to play from anywhere!!!! I love playing candy crush but level 1968 stinks I can not see passing this level not enough moves to plan and then when you try you get blocked, this stinks cuz I can’t see passing thie level so I guess I’m done playing ?????? Does anyone even check this? Well I tried and tried to get through this level with only 16 moves but it is very very difficult. I Would appreciate some help. What say you ??? I also have 16 moves only and an extra block in the middle!! Please make levels uniform every where. I agree with the above comments. Impossible in 16 moves. Please fix the problem, thanks!!! Extremely IMPOSSIBLE lvl with just 16 moves!! The video above is BS, I’m guessing the devs posted it. There’s NO WAY you get even ONE stripped candy to use let alone THREE like in the video!!!! 16 moves and not 20 in iOS5. Another negative review for inconsistency of play. Got a magik board on the second to last hard level which is the only reason I got through it. This is stinking ridiculous. Thank you Lin. I used three lollipops and as you said passed level. Thanks….such a time saver. No other way to pass this level. Not enough time to get the popcorn only 16 moves on my game can hardly get one stripe !! Grrrrrrrrrrrff!! 1968 completed! 4 boards! Break blockers. I only have 16 moves and not 20. This level is ridiculously hard. Please help! 1968 very easy if you have hammer boosters , just use them on popcorn !!! Cheating? No more than CC trying to get us to spend money !!! I’m not going to keep doing this when they keep messing around with the games, taking away moves. 16 moves?!? Ridiculous. I’m to the point where this game isn’t worth it anymore. Candy Crush is not longer any fun, the levels now are all luck not strategy, they lost it. Mine doesn’t look like that at all on 1968, yours is much easier!! Took FOREVER to complete this board. Had to use a CB with a stripped and wrapped candy. Yuck, I really hope there are no more of these. So much of a difference between yours and mine…like yours much better. May need a lot of help with this one! My board for 1968 doesn’t look like the one in any of the online solving samples. I another row of 3 blocks with icing, plus another row above that with one block. And also choosing fish isn’t an option. This is the same on my Mac desktop, my iPhone, and iPad. Nightmare. 16 moves and 4 layers to get through before the popcorn – not 2 layers and 20 moves like this video. No wonder you were able to do it. Heb maar 16 zetten in plaats van 20 zetten , wat een moeilijk level !!!! !